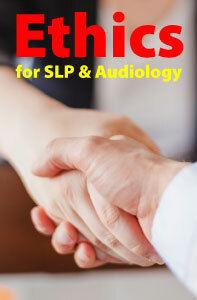 Ethics for Speech-Language Pathology and Audiology is a 2-hour online continuing education (CE/CEU) course that examines ethical issues that SLPs and audiologists may encounter in clinical practice. SLPs and audiologists encounter ethical issues across the spectrum of practice settings, from pediatric treatment to care of elders in skilled nursing facilities. This course will present an overview of ethical issues that arise in speech-language pathology and audiology practice, including barriers to ethical thinking, evidence-based ethics, economics, discrimination, abuse, bullying in the workplace, boundaries, confidentiality, social media, and infection control. Updates on the Codes of Ethics are included and discussed. Lisa D. Fuellemann, MS, CCC-SLP, is a Speech-Language Pathologist with experience in the acute and long-term care settings. Her specialties include dysphagia and cognitive language disorders.